In the heyday of the Great Silk Road, many ancient trails connected countries, people, goods, technology and ideas. Camels and mules, loaded with spice and porcelain, silks and medicines, carpets and jewels plied across the hot desert sands, mighty mountain ranges, and the green plains of the oases. Guest houses to accommodate the animals, merchants and goods were constructed about every 25-30 kms along the routes: these were known as Caravanserais. The word is derived from 'carvon' meaning a 'group of travellers' and 'saroy', which means house or palace. 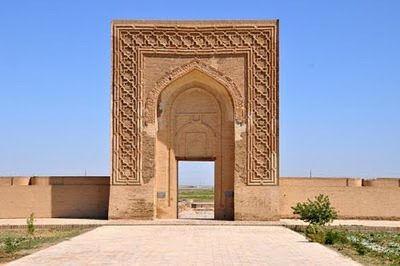 The first caravanserais appeared in Central Asia in the 9th century A.D. and were generally built by order of the rulers, governor-generals and wholesale merchants. Some of them were built inside the towns and did not require protection. Those built along the roads were small defensive fortresses. Generally caravanserais were two-storied structures of massive stone walls surrounding a square or rectangular yard, thick wooden gates often upholstered in metal, and no outside windows. There was a well in the centre of the courtyard, and sometimes the water was brought there from long distances. The ground floor served as stalls for pack animals and warehouses for the merchandise; the first floor provided space where travellers could spend the night without fearing for their cattle and goods. 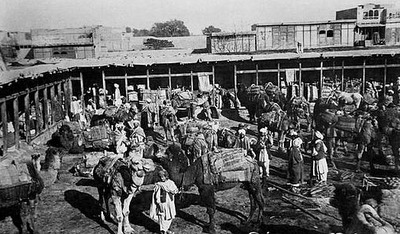 Caravanserais were full of people: merchants learnt the latest news, met new partners, made deals with traders from other lands and exchanged ideas and philosophies. They served as storehouses for major consignments, stock exchanges for price settings, intermediaries for transfers of oral and written messages, and wholesale centres. They also housed restaurants and artisans' workshops, such as tanners, blacksmiths and tailors. Hammam (baths) and tabibs (local healers) were at the disposal of travellers as well. With the rise of maritime trade and later railways, many caravanserais fell into ruin or disappeared altogether. In Soviet times some were used as warehouses, and today many of them serve as splendid bazaars for artisans' workshops and boutiques. In Samarkand, the Oriental Sweets tea house is located inside a restored 19th century caravanserai, close to the Registan. On the Kyzyl Kum desert road between Samarkand and Bukhara there is the impressive Rabati Malik caravanserai, built in the 11th century. It has been added to UNESCO's World Heritage tentative list. 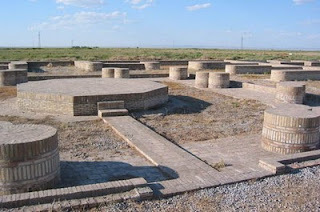 The ruins of this site have been preserved, and we will stop there en route to Bukhara. Materials source: Many thanks to Uzbek writer Nigora Abdukayumova, who is now based in Manila, Philippines.